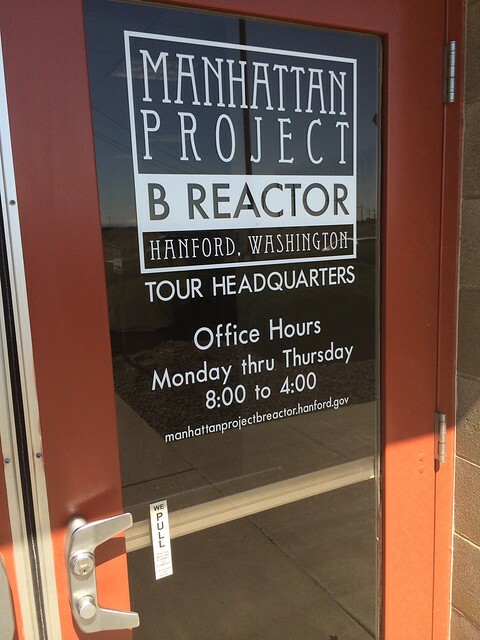 Earlier this week I finally had the chance to take the Hanford Site tour, which I found both educational and thought-provoking. Unfortunately photography wasn't allowed on our tour, so all I can offer is this picture of where it departs from. Although only a limited number of these tours are offered every year, and they fill up quickly, according to our tour guide at least a few people typically fail to show up for each of them, and their seats can be filled by people who show up at the tour headquarters without a reservation. Our tour guide also indicated that the companies currently handling Hanford's cleanup are looking for workers, a piece of information which I wanted to be sure to pass on; in addition to presumably being paid a premium for your labor, and in addition to enjoying more sunshine than you might in western Washington, you might also find some personal satisfaction in helping put the Cold War - obviously a very dark and fearful time in world history - away for good.